DML finally “dropped the other shoe” by releasing the standard version of the popular Marder III SP antitank gun. For reasons best known to DML and cyber-hobby.com it was originally released as a “boutique” kit with the odd choice of a training variant configured to run off propane gas. 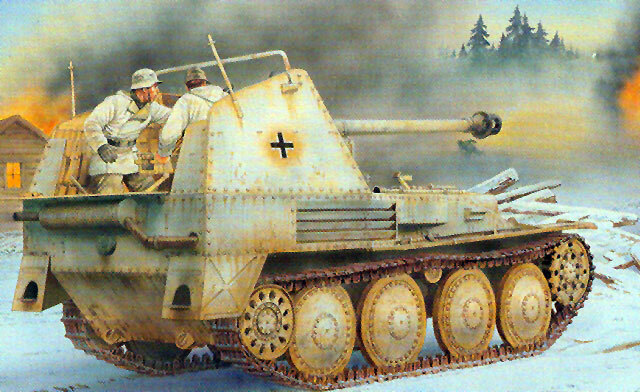 As such the review for the “stadtgas” variant applies to most of this kit, as they share nearly 100% of the same parts. Based on three previous DML kits – the Marder III Ausf. H “Smart Kit” (No. 6331), the Flakpanzer 38(t) “Smart Kit” (No. 6469), and their 7.5 cm Pak 40 (No. 6130) this kit also adds a large number of new parts – 113 styrene and 118 etched brass. Like the Ausf. H kit, it is nicely done, but unlike past “Smart Kits” - designed so that etched brass is either kept to a minimum or not required – this kit has a good amount of brass with it and it must be used to construct the model. Some of the frames and grilles will require a good amount of “origami” to shape so it is recommended that the modeler have a good bending jig like a Hold’n’Fold or Etch-Mate on hand. This kit does include the engine and other interior parts from the DML TNHP series kits as well as many new bits. While the directions are typical DML and as obtuse as usual, they are better about indicating what is optional and what it should look like in either position, such as the engine access hatches. The suspension is similar to that of the Tristar kits with each bogie assembly consisting of nine parts. A “doormat” type matting is provided for the floor of the fighting compartment. The driveline and interior are mostly styrene parts, such as the transmission/clutch assembly, steering controls, driveshaft and shield. The ammo racks are all molded as groups of tubes and dummy half rounds are provided to simulate a loaded tube. There is one small radio and it mounts on the right side of the casemate. Each periscope in the fighting compartment is all stryene (clear prism component, grey mounts) and may be positioned as folded or erected. This kit offers seven different finishing options: Unidentified unit, Italy 1943 (whitewash over sand); Unidentified unit, Italy 1944 (sand overall); captured British vehicle, Mozza Grogna, Italy 1943 (sand with green and tri-color roundels plus British AOS markings); Pz.Jg.Abt. 113, Eastern Front 1944 (whitewash over sand); Unidentified Unit, Eastern Front 1944 (sand with green mottle and “kill” rings); 12th SS Panzer Division “Hitlerjungen”, France 1944 (tricolor mottle, number 102); and Unidentified Unit, Eastern Front 1943 (thin green mottle over sand). Decals are targeted and from Cartograf. Assistance on this kit is credited to Tom Cockle and Gary Edmundson. Overall, this is a nicely done kit and given the overall popularity of these tank destroyers the wide-release version should do well.